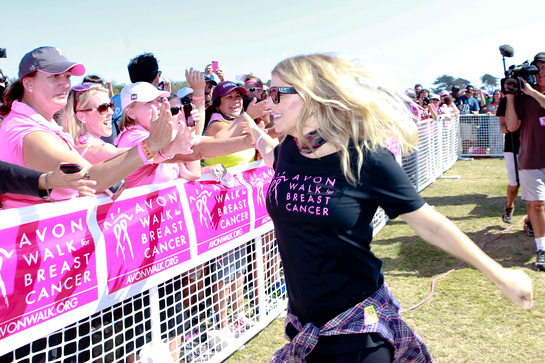 Fergie, eight-time Grammy Award winner and global ambassador for the Avon Foundation for Women, was a special guest at the tenth annual Southern California Avon Walk for Breast Cancer in Santa Barbara, CA, on September 22-23. The Avon Walk Santa Barbara, the seventh of nine Avon Walks this year, raised more than $4.7 million to advance access to care and breast cancer research. Fergie applauded the more than 2,000 women and men from 39 states (and Washington DC) and Canada and Northern Marine Island – including 271 breast cancer survivors – who were completing their second day of a weekend-long, 39.3 mile journey throughout scenic Santa Barbara. Fergie then joined the Walk participants’ family, friends and supporters at the inspirational closing ceremony at Carpinteria State Beach to announce a total of more than $3 million in initial grants awarded to nine breast cancer organizations in Southern California, ensuring the funds raised immediately benefit the community. More grants are slated to be awarded throughout the year to breast cancer programs nationwide. Fergie sports the 20th Anniversary Avon Breast Cancer Crusade Watch, available for $20 with 100% of net proceeds benefitting the Avon Breast Cancer Crusade. The Avon Breast Care Center at the UCLA. Jonsson Comprehensive Cancer Center and Olive View Medical Center received $750,000 to continue Avon Foundation support for the Avon Cares for Life Program, which includes on-site patient navigation, survivorship programs and a high-risk clinic, as well as support for their research clinical trials program. Olive View Medical Center received $750,000 to support the conversion of their screening facilities to 100 percent digital equipment. The updated mammography and ultrasound equipment will enable more patients to receive breast imaging and more cancers to be diagnosed earlier, while reducing wait times. The Dr. Susan Love Research Foundation received $500,000 to support the Love/Avon Army of Women. The Army of Women is changing the way that breast cancer research is done – significantly reducing the time it takes to recruit research study volunteers and encouraging researchers to study the changes happening in healthy women before breast cancer develops to learn how to prevent it. The John Wayne Cancer Institute received $300,000 to support its research study, which is looking into whether bacteria or a virus plays a role in causing breast cancer. Project Angel Food received $125,000 to support meal delivery and nutritional counseling services for people fighting breast cancer and their families throughout Los Angeles County. University of Southern California in Los Angeles received a grant of $250,000.